I am a mushroom fanatic! The other day a recipe for fried curried mushrooms on Indonesia-Eats caught my attention. I really liked the sound of deep frying mushrooms and I was surprised that I had never thought of it before. As if they did not sound good enough already, they were also curried! I don’t deep fry very often but I just had to try deep frying mushrooms! In an effort to ensure a nice and crispy coating I decided to go with a heavier batter and a panko breadcrumb coating. While I was thinking about the fried mushrooms and what kind of dipping sauce to enjoy them with I kept coming back to a gorgonzola blue cheese dipping sauce which I decided to go with. The curried deep fries mushrooms turned out great! They were nice and light and crispy on the outside and the mushrooms were nice and moist and warm and mushroomy good on the inside. Each bite of these crispy, crunchy curried mushrooms was magical…mmm… The blue cheese dip went really well with the fried mushroom finishing off a perfect appetizer! Mix the flour, water, egg and curry powder. Dip the mushrooms into the batter and then dredge them in the panko bread crumbs. I have had deep fried mushroom before. However yours looks way better in using so many things in it to add flavors! I am kinda mushroom crazy too. I am a mushroom fanatic too! And I, too, have never thought of deep-frying them! This is good stuff! Thanks for sharing! The famous fried mushrooms here in Indonesia is from Wonosobo (East Java) but I’m not sure whether they use curry. Anyway, your curried fried mushrooms looks yummy. I would never have thought to put curry in something fried, especially mushrooms. That is a great idea. I love fried mushrooms, but I love curry even more, they sound amazing. Hi Kevin…this sounds great and looks really wonderful!!! Oh, Kevin! I wish you posted this recipe 2 days ago. My mushrooms are now in the trash because I could not find a good recipe. I bought these very fat mushrooms the guy at the market claimed they were oyster mushroom (but I doubt it). I’ve never seen that kind before, and a short research I made online did not bring up anything that looked like oyster and my mushroom, or anything else familiar. This recipe might have worked. Oooh! I love fried mushrooms! Love the curry twist too. That looks fantastic! I love mushrooms and pretty much anything fried. Looks great, I love that you used oyster mushrooms! You can DEEP FRY MUSHROOMS? Why has no one ever TOLD me this before? Those. Look. Killer. You guys obviously haven’t been in the south before….fried mushrooms, fried green tomatoes, fried Snickers, fried pickles, etc. LOL! I love mushrooms, but have never thought of anything like this. I can’t wait to try it. Thanks for sharing! That’s an unusual recipe! These mushrooms look really delicious! Now I love mushrooms but I’d never have thought to deep fry them in curry flavoured crumbs! They look good! These must be fabulous with the addition of curry. Tey sure do look delicious, and perfectly colored, how do you do that! Never thought of using curry with fried mushrooms. Sounds really good! Back in the day,20+,we had a Fry Daddy and made fried mushrooms all the time. Such a mess. Never did I cut them. Good Idea. They look almost too good to eat. It’s been way too long since I had some fried mushrooms. Yours look amazing. Looks and sounds perfect! I love my mushrooms too and I love fried stuff, but I try not to fry anything at home. I like the idea of using oyster and king mushrooms. They give such a unique shape to the dish. I’m not a fan of mushrooms Kevin, but your picture looks great! I love the coating too! okay I’ll just take the mushrooms then. I’d only recently heard of fried mushrooms which is something that just blew my mind. These sound like they’d be incredible! Yum! I love mushrooms too. Curry is a postive addition as well. Love curry! Thanks! just wanted to say: dude, your blog is freaking awesome!!! They do look great! As much as we LOVE stuffed mushrooms, we’ve never thought about frying them. After seeing your beauties, we may have to try ones with a bit of filling in them. Good idea….Fry it, and even Mr. I-Hate-Vegetables will like it! Thank you! OH! I just must try this. You certainly have a way with mushrooms. Hmmmm they look like those fish dinosaurs (which I love), but I’m sure your curried fried mushrooms are much better! 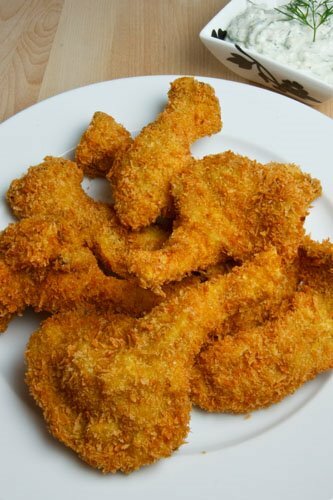 These look really yummy…panko bread crumbs plus curry powder seems like a great combination! There are so many possibilities for these too…would be great on a sandwich or as an app. Must give it a try !! Thanks for the recipe..
Yum, I love the addition of curry. It’s such a nice and surprising twist! appetizer? forget it, i would happily make this the whole meal. they look so, so good. Fried mushrooms are SO good! The curry and crispy panko really take thse over the top. Oh WOW those look amazing! Oyster mushrooms are my fav mushroom – and those babies are fried to perfection, my friend! I need to try this! I guess you fell in love with the deep fried curried mushroom, eh? I was always a fan of deep fried mushrooms, but never would I have thought of curry fried mushrooms. I love curry. I also like spicy curry, I wonder how hot Madras curry would work. I may have to give it a try. Thanks for sharing the recipe!